You are here: Home » Bomber CANS! Well it has happened! I expected it would when I saw mega cans of energy drinks and Bud and Bud Light in my local grocery store, but it has now happened in the (craft) beer world. I don’t know that Genesee beer would be considered “craft” beer, but none the less it seems that they are the first to the market with a 24 oz bomber can of beer that isn’t one of the big three. You may recall that in my last post I had a sip of the “Back in Black” from 21st amendment and immediately ran to the beer fridge to get the second can so I could sit outside on my front porch and smoke my cigar and have enough brew to get me through the entire stogy. At that point I asked myself why they don’t make a bomber can of beer? They make bomber bottles, and certainly there is a market for them, why then not a bomber can of brew that could carry you through a meal, or provide enough to share with friends. Well, here it is. Genesee a brewery in Rochester, NY, actually the oldest continuously operated brewery in the United States, has taken this idea and ran with it. I know I’ve seen Bud in 24 oz cans, and I think a few others have gone that way as well, and certainly Foster’s has had larger cans, but Genesee also makes the Dundee line of beers, and several other brews under contract so will this be the start of a trend in the craft beer world? What do you think about this idea? Would you like to see other breweries that are canning beer begin to can in larger size cans? As much as its sounds like a good idea, the vision of the 24 oz. can just screams low class to me. I hear you Rob, but if anyone can class up the 24 oz bomber it is craft beer. Think of the can art they could put together. Some of the 12 oz cans are pretty amazing looking. Now just think if you doubled the size of the canvas. It could be a pretty cool movement. I agree Kevin, but they also make the Dundee line of beers, and they are somewhat “crafty” and they brew on contract as well, so this might be something you see in the future. Before Craft beer hit I’m pretty sure Bomber bottles screamed low class too, ala Olde English 800. But I have to give this some air time, as I think it might be a good idea. Certainly you wouldn’t expect an entire Breweries lineup to be available in 24s but what about Maharaja? That might go very well in a 24, and I could see others too. “Somewhat crafty…” Oh, Don, that’s rich… I guess sort of crafty the way Saranac or Leinenkugels are. I’m not going to say that Dundees are not quality–they’re good, for the price. But why not spend a dollar or two more on a six pack? The quality is usually better at that price point. But, the Genny, those are like 95 cent cans, even at that size! I think we’re heading into Colt 45 territory here, Don. For some reason a 22oz. bottle is cool, sorta like wine, but a 24 oz. can should be placed in a paper bag and consumed in public. Now Jim, I have seen wine come in one liter pourable boxes for backpacking etc, this could start a cool trend. Like I told Rob, the can art could be amazing. I don’t know…I would not be quick to buy beer in a 24 oz can but I’m sure when Oskar Blues said they were going to put their beer in a can there were people just like me that shot it down. Yeah, it’s only a bad idea until it’s a cool idea. I think its great, but it would be greater at 50 oz. Who cares about class? Maybe we could start something here Scott. Like wine boxes but for beer in the fridge! We got the daisy cutter from Half Acre in a Tallboy. Mmmmmm good! A tallboy, meaning 16 oz? I’ve seen those befor, for example all Buckbean beers are canned in 16 oz tallboys. I want the Big ONE, bring on the 24s! 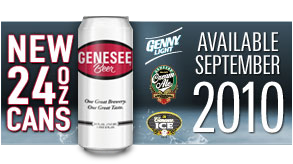 I went to college in Michigan where Genessee specifically Genny Cream was the preferred beer of the students because it was cheap so no, Genessee is not a craft beer. I do think it would be an excellent choice to wash down that scotch made out of pee. How’d he get that past the FDA any way? Its in England! No FDA over there! Cold Spring from Minnesota has a double pint can that’s good. I like the Old Johnny ale. Would that SATISFY THE THIRST! I tell you , I think I’m onto something here. Bomber cans could be a wave of the future. At least lets hope so!